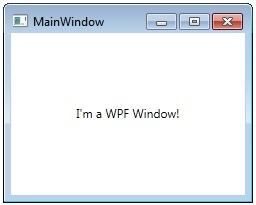 The Window class represents a window in WPF. It derives from ContentControl, which means that it can contain a single nested element that represents its content. It inherits directly from Control and indirectly from FrameworkElement, UIElement, Visual, DependencyObject, and DispatcherObject. A window consists visually of a client area (the inside of the window) and non-client area (title bar, frame and minimize/maximize/close buttons). It represents the main (outer) visual element that a user interacts with for a WPF standalone application. You can manage a window’s lifetime through methods like Activate, Close, Hide and Show and events like Activated, Closed, Closing, and Deactivated.